After all, Dorie says that French women dress this cake up with cream for their children's birthday parties. And if it's good for the French, it's perfect for me. Plus, I've baked this cake successfully a few times now so this seemed like a safe pick. Except I like living on the edge so I added a twist. A few days ago, Danone asked me if I would like to sample their newly launched flavored yogurts and give them some feedback. The yogurts come in Strawberry, Mango and Vanilla. Now I am not a fan of mango yogurts generally. And while their strawberry version was nice enough, it was too smooth and lacked the little bits that tell me "they must've put some fruit in there!". But vanilla, that's a clear winner. Health food it's not, packed as it is with sugar. But once you stop thinking about the health angle, you'd notice a beautiful vanilla flavor that would make this yogurt a nice dessert end to a meal. So back to my twist - instead of the plain yogurt Dorie calls for, I used the Vanilla yogurt. The rest is easy. Zest a lime. Rub the lime zest with 2/3 cup sugar (minus 2 tbsp to account for the sugar that the yogurt will add) until it's moist and fragrant. Add 1/3 cup vanilla yogurt and 2 eggs. Beat untill well mixed. Sift together a cup of flour, 1 1/2 tsp baking powder and a pinch of salt and add to the liquid ingredients. Mix well until no streaks of flour remain. Then add 1/3 cup canola oil and stir until everything's well blended into a shiny batter. 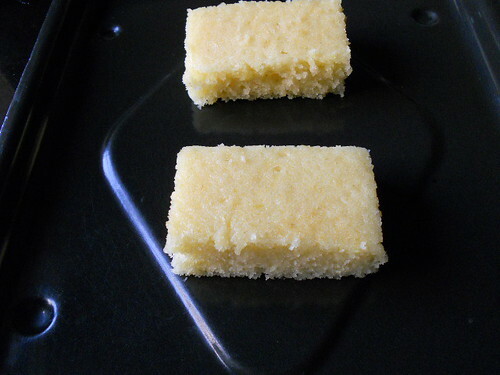 Pour the batter in a parchment lined 6 inch square pan and bake in an oven preheated to 180C for 40-50 minutes (or until a toothpick inserted in the center comes out with no crumbs). I let my cake cool, then cut it into bars to transform into pineapple pastries. So did I get close to the bakery version? Wait until tomorrow to find out. I love pineapple pastries!, this one looks gorgeous too., waiting to your next post, I made a pineapple pastry long back (eggless baking)with yogurt, it's still in my drafts!, I should try this. How cool that you got to sample Danone... and I love your yogurt cake. Cmon over...will teach you how to bake a sponge!